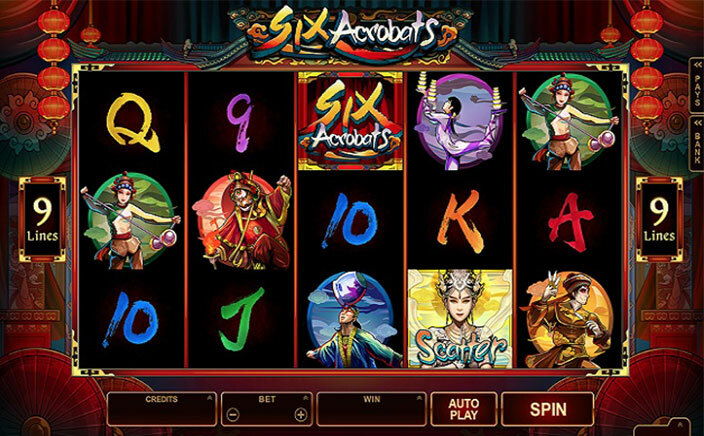 If the players adore Chinese circus and love to play online slots based on it, then this new amazing slot – Six Acrobats by Microgaming is fun to experience. The slot is based on an Oriental theme and features some engaging bonus rounds. The players must watch out for the mind-boggling acrobatic stunts in this slot and stand a chance of grabbing stunning winnings of 390,000 coins. Six Acrobats slot action takes place upon a traditional 5×3 grid and offers 9 fixed paylines. The slot has a very cartoonish, stylised outlay and the ornate reels spin across the background of Chinese lanterns along with umbrellas underneath a huge top canvas. Five acrobats portray the 5 high-value symbols and it has various knife throwers, jugglers and expert balancers to enjoy while 10, J, Q, A, and K forms up low values. The Six Acrobats slot logo acts as the wild symbol and besides its replacing power for all icons bar the scatter yellow acrobat, it also helps in forming winning combinations. Moreover, if any wild gets active during any combo in the base game, then it will multiply the wins by a 5x multiplier but if in case it appears in free spins round, then the multiplier increases up to a whopping 25x. Before players take any seat for this acrobatic show, they should set their bets. By making a click on the “Bet” button payers can place the bet on nine paylines and it varies from £0.09 to £22.50 a spin. Interestingly, any wins in this round will get multiplied by a 5x multiplier unless any wild symbol gets involved. Every scatter symbol that lands in this feature will reward 1 extra free spin to the players. 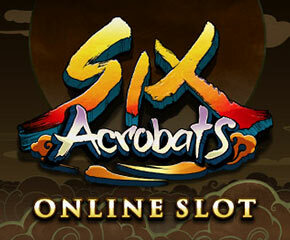 Six Acrobats is one of most wonderful slot launched by Microgaming. It has traditional yet high rewarding free spins round which offers hefty payouts to the players. The slot has a perfect combination of alluring graphics and synthesiser soundtrack which might entertain lots of players. The slot has medium to high volatility and comes with a decent RTP of 96.04%.